WP Ellie theme has been completely rebuilt on DaVinci WP theme. Since it is available in 2.0 Version, therefore it is completely new one. This theme offers better functionality. Theme is very stylish and clean in use. Ellie theme ensures very quick and easy operations to create a impressive business website, full fledged magazine style site and a simple blog layout. 2.0 solo stream theme has been designed. Responsive and latest design frame work is provided with theme. Logo integration is achieved quickly and easily. Featured videos slider, slider for featured photos and slider for featured pages are inbuilt in theme. All authors page template is an added attraction. Business sites having another home page template have lot of usefulness to website. Template for You Tube Video and portfolio page are in built with theme. Widget for Category posts, footer widget, widget for subscription form, social networking icon widgets, You Tube Videos widgets and featured page widget have been added in theme to make it workable and useful for websites where the theme shall be applied. Post thumbnails which are automatic are the beauty of the theme. Multiple banner ad locations are boon for websites. Multiple posts and pages layout options are quite supportive to workability of theme on website. Multiple home page layouts are embedded in theme. Author page which is in built is quite useful and plays dominant role. Narrow and wide featured articles slider is very helpful. Themes settings page for easy customization is provided. 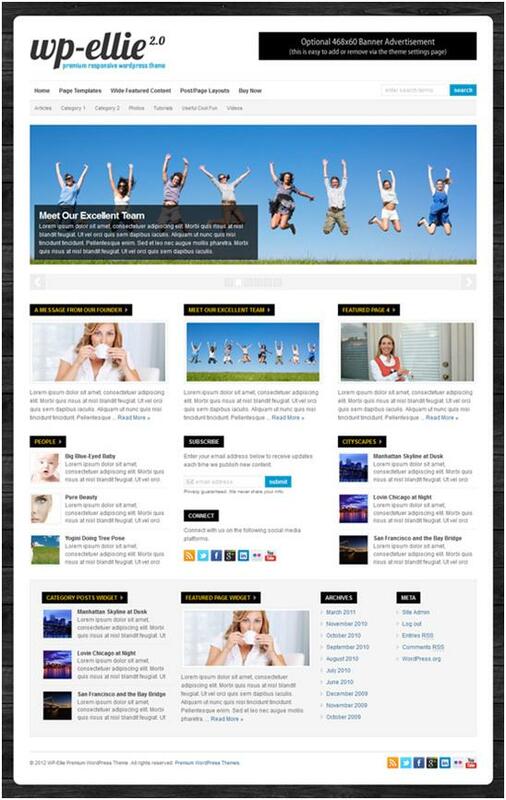 Most of the WP Plug-ins are workable with theme. Theme can adjust to browser size. Theme can be modified and used on several sites for ever without making any extra payments. Multiple options for colors and font make site very attractive. Theme is compatible with latest versions of WP. Paid customization service facility is available to club members. Overhauled image handling has been provided. Social media icons are available via social media icons widgets. Few new page templates and layouts have added beauty to websites which used this theme. No information regarding theme’s poor functioning are available.